Aerobics, dance sessions, and zumba were some of the fitness demonstrations on display on Tuesday at the opening of the renovated Queen Elizabeth II (QE II) Park and children’s playground. There was a relaxed atmosphere during the brief 31 May opening ceremony as participants placed great emphasis on recreation and exercise. Premier and Minister for Finance, Dr. the Hon. D. Orlando Smith’s callinvited residents to use the Park to stay fit. The Premier mentioned that chronic non-communicable diseases affect many residents and he hopes the Park will improve physical activity levels. Hon. 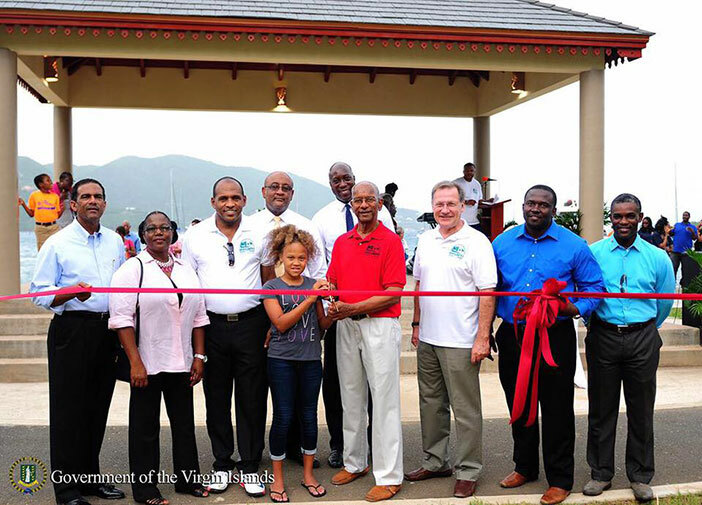 Smith announced that the renovated QE II Park ties into a promise his government made to create more green spaces in the Territory. He commented that the park can also be used for family outings and other community activities. The BVI Leader further noted that the Government intends to create a boardwalk that connects to the Tortola Pier Park, and he stated that the QE II space will connect to that boardwalk: “The [QE II] Park is part of my government’s vision for revitalizing Road Town…the city reflects its economical and historical importance,” he added. His Excellency Governor John Duncan also said that the Park will be a great venue for fitness activities, and he stated that he observed that people have been using the facility before the opening. “The new Park is to inspire and promote a healthy lifestyle for the community and visiting tourists…Every morning, runners come in under the fence clandestinely and every evening people come to train where I am standing; sneaking up under the fence to enjoy the Park”. “So now you can do it legally and that’s a great step…it’s a facility we should all be proud of, and our pride should extend on how we treat this facility and do our part to maintain it in the beautiful condition that we find it in today,” the Governor added. Minister for Communications and Works, and Fourth District Representative, Hon. Mark Vanterpool noted Government’s promise to increase green spaces and he encouraged residents to care for the facility. Permanent Secretary in the Premier’s Office, Mr Brodrick Penn pointed out that many contractors worked on the project and that many did so without pay: “70 contractors all over this island along with the several dozen workers were contracted in some form to help get us where we are today. And I am thankful to them for doing this, not just for the money, believe you me, my team and I nickel-and-dime each one of them to try to get their best prices,” he said. “And sometimes many of them work without money…So many of the contractors have expressed that they want Road Town to look good – ‘I want the Premier park to finish, I want the children to have a place to play’. The point is, yes they were doing it for the financial gain but all of these contractors were generally proud of participating in something special, to make an indelible mark on Road Town,” the Permanent Secretary added. The re-opened QE II Park includes a walking track that loops around its perimeter and includes pathways and hard landscaping, a lookout point, picnic areas, shaded structures, seating and a car park. It was also announced that the facility will be handed over to the National Parks Trust in the coming weeks for management.